Ice cream, slushies, popsicles, lemonade... all the foods that characterize a super fun summer. Our sugar intake tends to increase when we're out of school: meeting friends for ice cream, drinking milkshakes by the pool, or eating tons of candy at sleepovers. Of course, that's life. But as more and more studies point to the harmful effects of too much sugar (inflammation, acne, GI issues, even early death), something has to give. As we up our sugar intake in some places, it's important to watch out for added sugars elsewhere. We need to find a healthy balance. Many ordinary foods have mounds sugar hiding in them, and there are easy alternatives to avoid this! 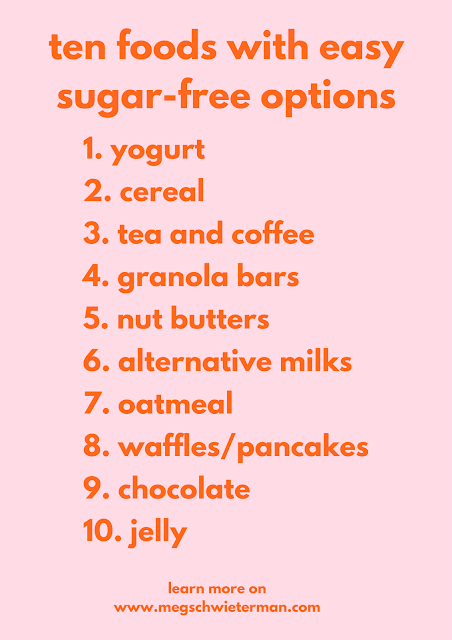 After being sugar free for three months, I found a lot of really yummy ways to cut out sugar. And I don't mean by using gross sweeteners made in a lab, these are natural, wholesome solutions. 3. Tea and Coffee // You can get used to anything. So, if you're hooked on super sweet tea or a coffee with 2 sugars, try giving it up for a week and use honey, coconut sugar, or unsweetened coconut milk. Coconut milk is naturally sweet and chock full of healthy fats! You'll get used to the taste and save yourself sugar on the daily. 4. Granola Bars // Tons of granola bars marketed as "healthy" are chock-full of sugars. Try RX Bars, Simple Squares, or make your own! 5. Nut Butters // There's a reason why all homemade nut butters are all over heath bloggers' Instagrams. They're yummy, fresh, customizable, and do not contain the sugar content of many store-bought brands. 6. Alternative Milks // If you're a vegan or a nut milk drinker, be sure you check the ingredients. Extra sugar is a common preservative and ingredient in almond, soy, coconut and other milks. For an easy, real food, all natural version, it's easy to make your own. 7. Oatmeal // Spice up your morning oats with cinnamon, fruit, and nut butter instead of sugar. 9. Chocolate // After being sugar-free, my lifesaver has been coconut sugar chocolate (like Eating Evolved or Vivoo). 10. Jelly // If you're a pb + j lover, it'd be easy to sub your jelly for a brand with no added sugar, like Dafour. Or, you can make your own fruit reduction by boiling berries with citrus juice until they break down. Enjoy your summer, and remember it's all about balance. Eat that popsicle, but look out for those extra sugars! ps- so sorry if you saw this post unfinished last week! I accidentally took it out of drafts when it wasn't done.